This term ran from Monday February 4 to Friday April 5. This term runs from Monday April 29 to Friday June 28. This term will run from Monday July 22 to Friday September 20. 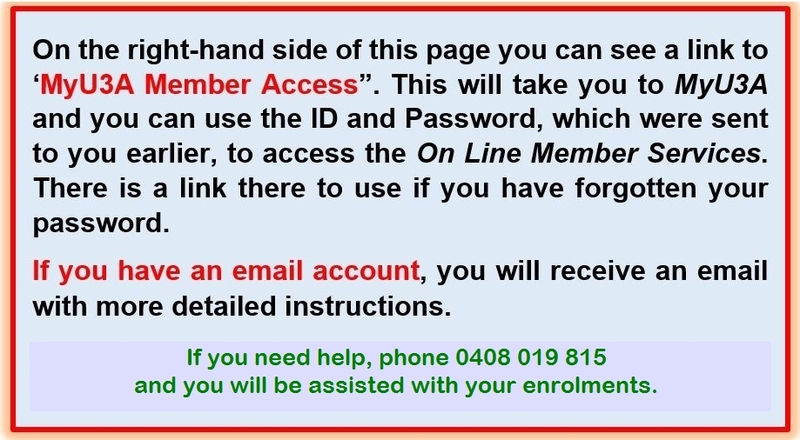 This term will run from Monday October 14 to Friday December 6.
box below, or simply click on it, to be taken to the MyU3A login page. These talks are open to the general public and admission is by gold coin donation. However please phone, in advance, on 9817 7736, to ensure adequate seating arrangements. The views expressed by the presenter in these sessions and by tutors in all classes are their own views and not the official views of U3A Deepdene. Our aim is to encourage the exploration of ideas, in a relatively free environment. To view and/or download this information as an A4-size flier, please click here. The following talks will take place every Thursday during Term 1 (2019) from 12noon to 1:15pm. two years on Napoleon or de Gaulle? What can Royal Commissions actually achieve? Our program guide features a separate section devoted to Visits & Outings offered during term 2 of 2019 and the holiday break which will follow.